Combined company will offer the most comprehensive health benefits platform on the market. Expanded product offering and distribution channels will accelerate growth on larger revenue base. John Doyle to become CEO and Derek Newell to become president of combined company. San Francisco and Mountain View, CA – January 4, 2017 – Castlight Health, Inc. (NYSE: CSLT) and privately held Jiff, Inc. announced today their agreement to come together to form a single company. The combined entity will offer the most comprehensive health benefits platform in the industry, helping employers, as well as millions of employees and their families, manage their health benefits dollars more effectively. Together, the combined company will serve more than 240 customers, including over 70 of the Fortune 500. Castlight pioneered health care transparency, and today helps employees make better health decisions by guiding them to the right program, care and provider. Jiff redefined the wellbeing industry with an exceptional, mobile-first user experience and the largest ecosystem of health partnerships available in the market. The combined platform will seek to improve every aspect of an employee’s health experience: from staying healthy, to accessing care, to managing a condition. For benefits and HR leaders, the combined platform will make it more efficient than ever before to engage with employees, purchase and deploy a wide range of benefit technologies, and measure impact — enabling them to reap the benefits of lower health care costs and a healthier workforce. Jiff serves as a central hub for wellbeing and other benefit programs, with a single point of access for employees. Jiff’s app-store approach integrates more than 50 health solutions that sync seamlessly with its back-end system. In addition, an employer can allow virtually any vendor to connect to the platform, whether or not Jiff has integrated with them in the past. Jiff then personalizes recommendations for each employee based on the most relevant tools for their health needs and preferences. This is all delivered through a user experience that brings together the latest advancements in incentive design, social theory, and game mechanics — optimizing engagement. “Jiff harnesses the power of digital health solutions and the related ecosystem, bringing it all together in a way that gets employees engaged. Combine that with Castlight’s robust data assets and personalized messaging capabilities, which already have helped transform how employees make health decisions, and I believe we will create the industry leader for enterprise health benefits management,” said Derek Newell, chief executive officer of Jiff. In addition to having complementary technologies and client lists, Castlight and Jiff have established strong partnerships with major players focused on the health benefits industry. For example, Jiff has established successful channel referral relationships with Willis Towers Watson and Mercer, among others, while Castlight’s strategic partnerships include Anthem and SAP. The combined company will be highly focused on leveraging each other’s channel relationships to maximize growth and better fulfill these partners’ respective goals. 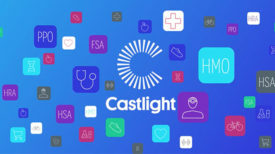 “In 2015, we chose to collaborate with Castlight to bring their powerful decision support and engagement capabilities to consumers and employers. With this announcement, we will now be able to deliver an even more comprehensive solution to consumers across the full spectrum of care and expect the combined solution to be attractive to large employers and their employees,” said Morgan Kendrick, president of Anthem Inc.’s national accounts business segment. Castlight will issue approximately 27 million shares and options at the closing of the transaction to former Jiff equity holders, representing approximately 20 percent of the combined company on a fully-diluted basis. The issuance of up to an additional 4 million shares is contingent on the achievement of specific growth objectives for the Jiff business in 2017. The transaction is expected to close in the first half of 2017 following satisfaction of customary closing conditions, including approval from Castlight’s stockholders with respect to the issuance of Castlight shares in the transaction. Following the closing of the transaction, Castlight’s president and chief operating officer, John Doyle, will assume the role of chief executive officer of the combined company. Jiff’s current CEO, Derek Newell, will become president of the combined company, responsible for sales and marketing, research and development, and professional services, and will report directly to John Doyle. Giovanni Colella will continue his service with Castlight in the role of executive chairman of the board of directors, focusing on deepening key partner and customer relationships. In addition, effective upon closing the transaction, two members of the current Jiff board of directors will be appointed to the Castlight board of directors and one of Castlight’s current board members, Ann Lamont, will step down. Castlight expects to report full year 2016 GAAP revenue of approximately $102 million, which is the high-end of its previously issued guidance range, and annualized recurring revenue (ARR) of approximately $122 million exiting the year. Jiff is expected to generate approximately $7 million in GAAP revenue for the full year 2016, with ARR of $17 million exiting the year. Jiff’s ARR was up over 100% from the end of the first half of 2016, a reflection of their strong momentum in the market place during the year. The combined company is expected to generate approximately $138 to $142 million in pro forma non-GAAP revenue for the full year 2017. The high-end of this range assumes Castlight contributes $123 million and Jiff contributes $19 million with no impact from purchase accounting adjustments. This would represent pro forma growth of approximately 27% to 30% for the combined company. Management believes the combined company will be well positioned to sustain this level of pro forma growth in 2018. The fourth quarter and full year 2016 results for both Castlight and Jiff are preliminary in nature and subject to change based on the completion of the year-end close process. In addition, as part of the acquisition’s close process, Jiff’s accounting policies will be conformed to Castlight’s, which could cause Jiff’s actual historical results to differ from the preliminary results shared in this release. After the close of the transaction, Castlight plans to provide GAAP revenue guidance for the combined company after it has completed its valuation work and related purchase accounting considerations regarding Jiff. Jiff has been in investment mode to support their rapid growth. As Jiff is integrated with Castlight, management expects to realize operating efficiencies which, when combined with an accelerated revenue growth profile, is expected to enable the combined company to reach cash flow breakeven by the end of 2018. Importantly, management expects the cash balance of the combined company will be $60 million or greater when this breakeven milestone is reached. Castlight’s financial advisor for the transaction is Allen & Company LLC, with Fenwick & West LLC acting as its legal advisor. Piper Jaffray & Co. is serving as Jiff’s financial advisor, with Gunderson Dettmer serving as its legal advisor. Castlight Health will host a conference call to discuss the transaction today at 2:30 p.m. Pacific Time (5:30 p.m. Eastern Time). A live audio webcast of the conference call can be accessed through the company’s Investor Relations website at http://ir.castlighthealth.com. In addition, an archive of the webcast can be accessed through the same link. Participants who choose to call in to the conference call can do so by dialing 1-877-201-0168. The conference ID number is 44384541. A replay will be available for one week at 1-855-859-2056, passcode 44384541. Jiff is on a mission to help companies lower healthcare costs and cultivate happier, healthier employees. Jiff’s enterprise benefits platform integrates all the vendors employers already have in place, and lets them choose from over 50 pre-integrated services. By delivering personalized incentives, real-time data analytics, and a beautifully designed experience, Jiff targets individual employee cost drivers and increases utilization of those services proven to save money. Based in Mountain View, CA Jiff is led by veteran healthcare and technology leaders and serves some of the largest employers in the world. Smart benefits; brilliant design. This press release contains forward-looking statements about Castlight Health’s expectations, plans, intentions, and strategies, including, but not limited to, statements regarding the proposed transaction with Jiff, Inc., the expected benefits to Castlight Health, its customers, partners and stockholders from consummating the transaction, leadership changes in connection with the proposed transaction, expectations of full year 2016 or 2017 revenue and ARR for each of Castlight Health and Jiff, projections of pro forma revenue and growth, cash flow, and other metrics, whether for each individual company or the combined company, expected operating efficiencies as a combined company and market expansion opportunities. Statements including words such as “anticipate,” “believe,” “estimate,” “will,” “continue,” “expect,” or “future,” and statements in the future tense are forward-looking statements. These forward-looking statements involve risks and uncertainties, as well as assumptions, which, if they do not fully materialize or prove incorrect, could cause our actual results and performance to differ materially from those expressed or implied by such forward-looking statements. Such risk factors include those related to: required regulatory approvals and the satisfaction of other closing conditions, the potential impact on the businesses of Castlight Health and Jiff due to uncertainties regarding the acquisition; the retention of employees of Jiff and the ability of Castlight Health to successfully integrate Jiff and to achieve expected benefits; general economic conditions; fluctuations and volatility in Castlight Health’s stock price; the ability of Castlight Health to successfully execute strategic plans; maintaining customer and partner relationships; the timing and market acceptance of new releases and upgrades; and the successful development of new products, and the degree to which these products and businesses gain market acceptance. Additional information concerning these and other risks and uncertainties include those described in Castlight Health’s documents filed with or furnished to the Securities and Exchange Commission. All forward-looking statements in this press release are based on information available to Castlight Health as of the date hereof. Castlight Health assumes no obligation to update these forward-looking statements. To supplement Castlight Health’s and Jiff’s financial results presented in accordance with generally accepted accounting principles (GAAP), Castlight Health and Jiff also use and provide investors and others with forward-looking non-GAAP measures of certain components of financial performance, including expected non-GAAP revenue, non-GAAP operating loss and non-GAAP net loss. These non-GAAP financial measures differ from GAAP financial measures in the following ways: Castlight’s non-GAAP metrics exclude stock-based compensation expense, the capitalization and amortization of internal-use software and charges related to the proposed acquisition, as well as the associated tax impact of these items; Jiff’s non-GAAP metrics exclude potential purchase price accounting impact on revenue, stock-based compensation expense, and expenses and charges related to the proposed acquisition. Castlight Health and Jiff believe that these non-GAAP financial measures provide useful supplemental information to investors and others, facilitate the analysis of each of the company’s core operating results and comparison of operating results across reporting periods, and can help enhance overall understanding of each of the company’s financial performance, on a standalone and pro forma basis. Castlight Health and Jiff have not provided a reconciliation of these non-GAAP measures because they could not produce the corresponding GAAP financial measures by the date of this press release without unreasonable effort. The factors that may impact our expected stock-based compensation expense, capitalization and amortization of internal-use software and charges related to the proposed acquisition cannot be reasonably predicted or estimated until the completion of our year-end financial close process. Castlight Health will present its GAAP results and a detailed reconciliation of each non-GAAP financial measure to the most directly comparable GAAP financial measure in connection with its press release reporting full financial results for the quarter and year ended December 31, 2016. These non-GAAP financial measures should be considered in addition to, not as a substitute for or in isolation from, measures prepared in accordance with GAAP. Further, these non-GAAP measures may differ from the non-GAAP information used by other companies, including peer companies, and therefore comparability may be limited. Castlight Health and Jiff encourage investors and others to review each of the company’s financial information in its entirety and not rely on a single financial measure. In connection with the proposed transaction between Castlight Health, Inc. (“Castlight”) and Jiff, Inc. (“Jiff”), Castlight intends to file a registration statement on Form S-4 with the Securities and Exchange Commission (“SEC”). This registration statement will contain a joint proxy statement/prospectus/information statement and relevant materials concerning the proposed transaction. Additionally, Castlight intends to file with the SEC other relevant materials in connection with the proposed transaction. After the registration statement is declared effective by the SEC, Castlight and Jiff will deliver a definitive joint proxy statement/prospectus/information statement to their respective stockholders. STOCKHOLDERS OF CASTLIGHT AND JIFF ARE URGED TO READ ALL RELEVANT DOCUMENTS FILED WITH THE SEC, INCLUDING THE DEFINITIVE JOINT PROXY STATEMENT/PROSPECTUS/INFORMATION STATEMENT, BECAUSE THEY WILL CONTAIN IMPORTANT INFORMATION ABOUT THE PROPOSED TRANSACTION. Investors and security holders will be able to obtain the documents free of charge at the SEC’s web site, http://www.sec.gov. Documents will also be available for free from Castlight at www.castlighthealth.com. Castlight and its executive officers and directors may be deemed to be participants in the solicitation of proxies from Castlight’s stockholders with respect to the matters relating to the proposed transaction. Jiff and its officers and directors may also be deemed a participant in such solicitation. Information regarding any interest that Castlight, Jiff or any of the executive officers or directors of Castlight or Jiff may have in the proposed transaction with Jiff will be set forth in the joint proxy statement/prospectus/information statement that Castlight intends to file with the SEC in connection with its stockholder vote on matters relating to the proposed transaction. Information about the directors and executive officers of Castlight, including their respective interest in security holding of Castlight, is set forth in the proxy statement for Castlight’s 2016 Annual Meeting of Stockholders, which was filed with the SEC on April 29, 2016. Stockholders may obtain additional information regarding the interest of such participants by reading the definitive joint proxy statement/prospectus/information statement regarding the proposed transaction when it becomes available. These documents can be obtained free of charge from the sources indicated above. Copyright 2017 Castlight Health, Inc. Castlight Health® is the registered trademark of Castlight Health, Inc. Other company and product names may be trademarks of the respective companies with which they are associated.